The St. Patrick’s Day Parade in New York is 14 years older than our country, dating to 1762. 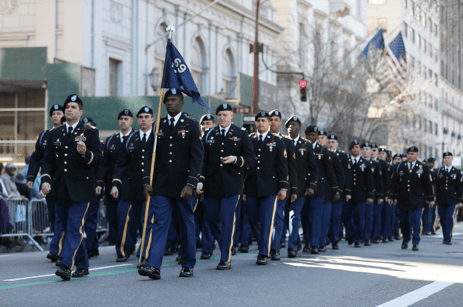 The parade’s line of march is traditionally led by the honor guard of the 69th Regiment of the New York State National Guard, the storied “Fighting 69th.” And therein lies a tale. The 1850s was a turbulent time in New York as the city grew and immigrant groups like the Irish faced opposition and bigotry (“No Irish Need Apply”) from Nativists and Know Nothings, as Martin Scorsese’s “The Gangs of New York” so vividly portrayed. Irish-Americans decided it was time to form an Irish Brigade to defend their interests and, possibly, to fight the English for Ireland’s independence back on the Auld Sod. That never happened, but when the Civil War arrived, the Irish Brigade, now reorganized as the 69th Regiment, volunteered to fight for the Union cause and were soon noted for their willingness to tackle tough missions. They fought bravely at Antietam and Gettysburg, but entered immortality with their audacious charge up Marye’s Heights at Fredericksburg. The Confederate officers and troops actually cheered them for their courage in the attack. The phrase “Fighting 69th” was coined by none other than Confederate Gen. Robert E. Lee, who paid tribute to their bravery in his communique on the engagement. The 69th made further history in World War I, when it was sent over to France in October 1917 as part of the 42nd “Rainbow” Division of the American Expeditionary Force. It was recognized for its heroics at Rouge Bouquet, Champagne, Chateau-Thierry and Meuse Argonne. The brigade commander, Gen. Douglas MacArthur, seriously considered naming its chaplain, Fr. Francis Duffy, the regimental commander, an unheard of honor for a priest. Today a statue of Father Duffy stands just south of the TKTS booth in the Theater District in what is known as Father Duffy Square. They showed the world at Fredericksburg how Irish soldiers die. . . .
And the Shamrock be cheered as the port is neared by our triumphant throng. New York will be seen one Irish green when the Sixty-ninth comes back. And indeed, upon their return the Sixty-ninth were given a hero’s welcome. The regiment has continued to distinguish itself in our country’s service ever since, in World War II, Korea, Vietnam, Iraq and Afghanistan. Irish-Americans, in fact, have won more Medals of Honor than any other American ethnic group. The Sixty-ninth’s devotion to duty and patriotism have continued to earn it pride of place at the front of the march each St. Patrick’s Day. But there has been one slight change. In the Civil War the Sixty-Ninth was 90 percent Irish. In World War I it was 50 percent Irish. And now — as you can see for yourself if you get out onto Fifth Avenue in time on Saturday to see the regiment and its mascot wolfhounds lead this year’s parade— the Sixty-Ninth is indeed a “Rainbow” division of diversity, no more than 20 percent Irish. Whatever their ethnic origin, St. Patrick’s Day is the day that all New Yorkers are honorary Irishmen. God Bless America, and God Bless the Irish!